This page contains ancient drawings of both aliens and ufos. These drawings of ancient aliens are famous, and many of them are featured in museums and are also available to the general public through cave viewings. The depictions of aliens and ufos are obvious, thinking that these pictures and artwork represent other things is possible. However the more realistic idealogy is that these are things that these ancient people saw a long time ago and they represented them through drawings. Often times stories about ancient aliens accompany the drawings, some stories of ancient aliens were handed down generation to generation. This Ufo Artwork is Dated B.C. (before Christ). For artwork dated A.D (after death of Christ) click here or go farther down this page and click on Page 3. IMPORTANT: One defining factor in many of these pictures is the Halo around the head of the alien. In my opinion this means that they are Angelic, like Angels, meaning from Heaven, (heaven-the sky-or the heavens). 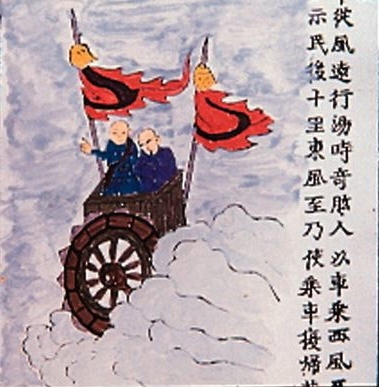 This is an old Chinese illustration from a fictional book entitled "Illustrated Survey of Weird Countries" (c.1400 A.D.) and had the following original caption: "Ji Gung Land: The people could make flying cars that travelled far with a suitable wind. In Tarng's day (c.1700 B.C. ), Ji Gung people flying a car on a westerley reached Yew Jo. Tarng dismantled their car so it could not be demonstrated to the people ... Later an east wind came on which he had them fly the car back to their own country [5,000 km] west pf our gateway." This artwork is alledgedly from the buddhist Dharamsala temple in Himachal Pradesh, India. 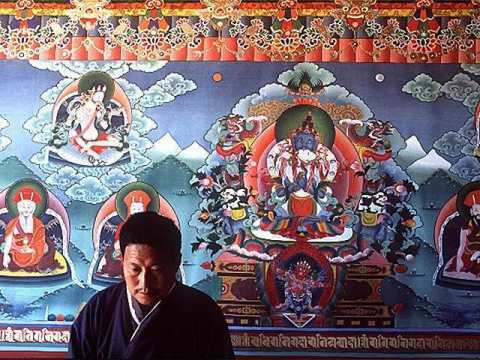 This is where the Dalai Lama lives in exile. You can just make out six silvery saucer shaped objects. 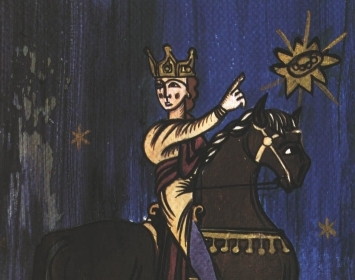 These images of two crusaders date from a 12th century manuscript " Annales Laurissenses" (volumes/books about historical and religion events)and refer to a UFO sighting in the year 776, during the siege on Sigiburg castle, France. The Saxons besieged and surrounded the French people. They both were fighting when suddenly a group of discs (flaming shields) appeared hovering over the top of the church. 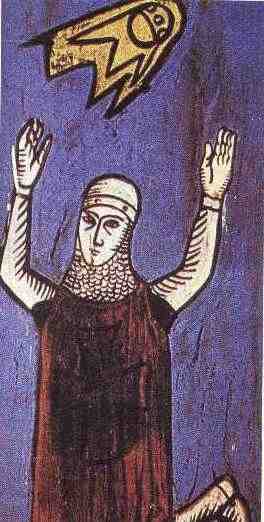 It appeared to the Saxons that the French were protected by these objects and the Saxons fled. 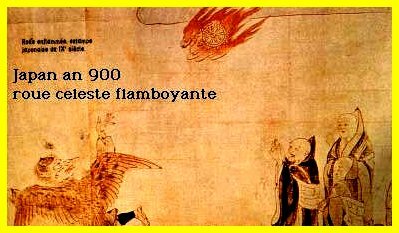 This is an illustration depicting a sighting of a burning wheel in the year 900 over Japan. 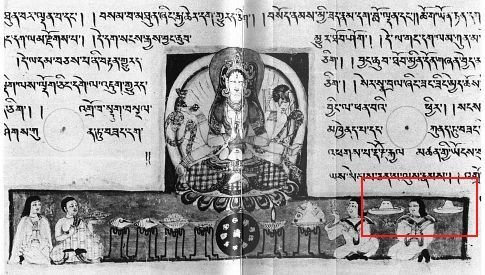 The above image comes from the 10th Century Tibetan translation of the Sanskrit text "Prajnaparamita Sutra", held at a Japanese museum. In the enlargement you can see two objects that look like hats, but why are they floating in mid air ? also one of them appears to have port holes on it. Indian Vedic texts are full of descriptions of Vimanas. The Ramayana describes Vimanas as a double decked, circular or cylindrical aircraft with portholes and a dome. It flew with "the speed of the wind" and gave forth a "melodious sound".